yes , you can claim deduction on the basis of possession and without registration this is as per Section 53A in The Transfer Of Property Act, 1882. Further 1.5 lakh limit included 1/5 of pre construction period interest . Person can claimed only one house as self occupied and other will be treated as let out if not actually let out . so if you not want to let out any of the house then one house will be treated as self occupied and other will be let out. So actual stay is not important. 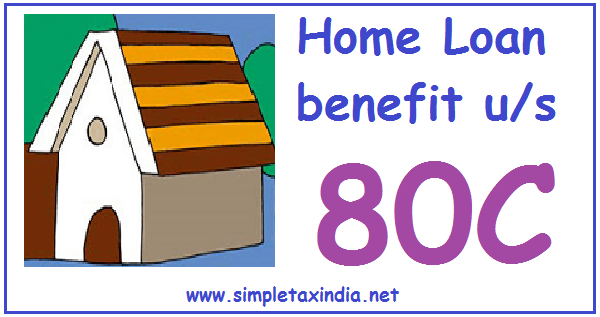 On both self occupied house /let out house you can claim 80C (principal repayment benefit) and interest benefit . Hi, I would like to know whether if the sale deed is registered at the guidance value but the bank advances loan equivalent to 85% of the market value(where market value is much higher than guidance value) that I buy a property at, can I claim home loan exemption for principal and interest for the entire value of home loan or only on the value registered in the sale deed(by assuming the bank had only loaned the amount mentioned in the sale deed)? I have a house property I bought in 2004 for Rs. 40 lacs with the help of a home loan of Rs. 30 lacs. In 2008, I refinanced this loan basis the market value of my property at that time through another bank, i.e. took a loan of Rs. 65 lacs against the property value of Rs. 80 lacs in 2008 and paid off the first loan. If I sell the property now, I know I can include the interest I paid on the original loan of Rs. 30 lacs under cost of acquisition while computing capital gains. Though the law is silent, to be fair the interest I include in cost of acquisition should be over and above the interest I claimed as deduction u/s 24. My question is, can I also include the interest on the second loan of Rs. 65 lacs (over & above the interest claimed u/s 24) in my cost of acquisition? If so, is there any judgement or guideline etc. supporting this? If not, will I not be understating my cost of acquisition as no interest on loan after 2008 will be included? a) Can my son get loan if the property is in my name. b) Will he be entitled to income tax benefits for this loan. c) construction is expected to complete in this FY, will he get tax benefit in this year i.e FY2013-14. i) Can my son get loan on my property. ii) Will he be entitled for income tax benefits on the loan taken on my property. iii) Construction is expected to complete within this FY. Can he claim tax benefits for this FY 2013-14. I have first house in Chennai were my parents are staying and I am claiming on the actual interest and principal paid (Interest – 1.5L Max, Principal -1L Max). second house is registered in my wife and myself. Whether I am eligible to claim the complete interest ? Since she is not claiming this for her tax deduction. I understand I cant claim the HRA if I claim interest paid on the second house. Whether there will be any change in the tax deduction by claiming the interest paid on the second house? If I rent the second house, can I claim the HRA. Please advise. Hra is allowed only if you are living in rented house only .No other condition is to be fulfilled . Further you can only claim one house as self occupied(of your choice) and other house will be deemed to be let out . If house is registered on you and your wife's name but full money is paid by you then you can claim full deduction of interest and principal. so it is better to show one house as let out . In case of sale of house property, can one claim service tax paid to builder from sale price of the house as cost of acquisition? yes , service tax is part of cost of acquisition of the house and shall be considered while calculating capital gain. Thanks for your nice article. It will be helpful for me if you could answer my following queries. 1. I am paying the home loan since April 2012, and I got possession in August 2013. So, as per my understanding, for the period April 2012 to March 2013, I can claim the interest portion of home loan in 5 equal installments in next five years. However, I missed to claim this (one installment) in my previously filled return. So, can I claim the next installment in present year’s return? 2. ITR-1 is the correct format for filling such returns and considering the pre-possession interest portion? Thanks in advance and expecting your kind cooperation in this regard. 1.Your understanding is correct , you can claim interest for Fy 12-13 in five equal installments starting from Fy 13-14 to 17-18 .You can claim 20% part in Fy 2014-15 even if you have not claimed the interest in Fy 13-14. Thanks for your reply Mr. Raja Babu. It is indeed very helpful for me. Myself and my Brother bought a Plot for 35 Lakhs in which 20 lakh paid by self and took a loan of rest 15 Lakh. (house is on fathers name and Loan is on Me and my brother) EMI is being paid from my brothers account sum of 15300/-. My question is Can i claim 15300/- tax benefit 80C?? Thank you for the information rendering by you and helping me too.So keep sharing such useful information to us .To know about this information i really want to see about it more. Sir, I want your suggestion. I have 2 properties in Mumbai. 1BHK & 2BHK flats.I have housing loan on both the properties @7 lakhs on 1 BHK & 40 Lakhs on 2BHK . If i sell my 1BHK flat and repay both the housing loans ,what will be the tax implications on the loan repayment . further ,the balance amount from the proceeds if invested in another 3rd 1BHK Flat which was partly paid to builder 2 years ago . then what will be the tax implication . She has not made any contribution in the purhcase of home. All payments are made by me. Now buyer of property wants to deduct TDS 194(1A) in equal ratio. 1) Please advice is it ok for buyer deduct TDS in my name only. 2) Will registrar or ITO have any objection if 100% TDS is deducted in my name? Deduction For Stamp Duty and Registration Charges which can be claimed only in the year in which these expenses are paid. Are these claims are reversible if house property get sold within 5 years of possession?